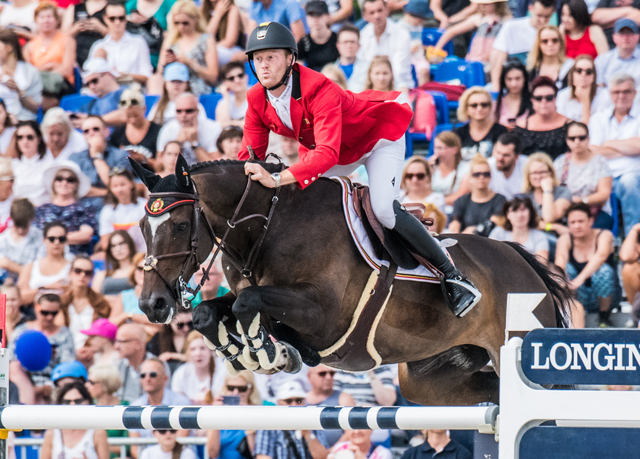 Niels Bruynseels and Cas de Liberte played a key role in Sunday’s win for Team Belgium at the Longines FEI Jumping Nations Cup™ of Poland in Sopot (POL). Photo: FEI/ Lukasz Kowalski. It’s always a good week in Belgium (the whole country smells like waffles, or so I imagine), but it’s been an especially successful one for Belgian sports of late. If you’re following the FIFA World Cup, you may have watched Belgium stomp all over Panama yesterday in a 3-0 shutout. And if you’re following the Longines FEI Jumping Nations Cup™, you may have watched Team Belgium take the victory in the fourth leg of the Europe Division 1 series in Poland’s seaside town of Sopot on Sunday. “The course was tough — big and technical — and the time was quite tight, but we came here well prepared, with a strong team, strong riders and a good tactic, and everyone did a super job!,” team anchor Niels Bruynseels said. Teammates Jerome Guery with Garfield de Tiji des Templiers, Pieter Devos with Claire Z, and Pieter Devos withH & M Ikker all pulled their weight for the win, which will put them just 10 points behind the Swiss at the top of the league table. Team USA finished third (which is more than we can say for our non-existent performance in the FIFA World Cup) — see full results here. Enjoy this replay of Belgium’s winning rounds courtesy of FEI TV!